Genealogy - the process of researching your family history - has become enormously popular in recent years. This is mainly because the Internet has made it a lot easier to gain access to information sources such as records of births and deaths, and local parish records. As a result, there's been a boom in genealogy software that aims to help you compile your family tree. However, a genealogy program is essentially a database that stores information about family members. You still have to do all the research yourself, so the key question is whether or not the program makes it simple for you to manage the information that you come up with. As the name implies, Family Tree Legends: Starter Edition is aimed at those who are looking into their family history for the first time, and it does a good job of helping you to get started. You're also supplied with a trial subscription to a 'BDM' Web site called The Genealogist (it stands for births, deaths and marriages). The site carries UK census and local parish records for the period 1841-1891, and your trial subscription enables you to conduct ten free searches to locate information about individuals whose names you enter into the site's search engine. Additional searches will cost extra. Most BDM sites provide a number of subscription options, either on a monthly or 'pay as you go' basis, but this free trial should be enough to get you started and maybe get you hooked. Another useful aid is the Family Tree Wizard, which guides you through the process of creating a family tree database file. It starts by asking you to enter the name of one individual who is the starting point for the family tree. Then it creates an entry for that person, which includes information such as their date of birth and spouse(s). That page then becomes the 'home page' for that person. Your family tree home page has a number of buttons that link it to other pages. These buttons perform two different tasks. The first is to open up additional pages that contain more detailed information about that person, such as their medical history or important events in their life. There's also a multimedia 'scrapbook' option, which enables you to store photos, video clips or scanned documents. 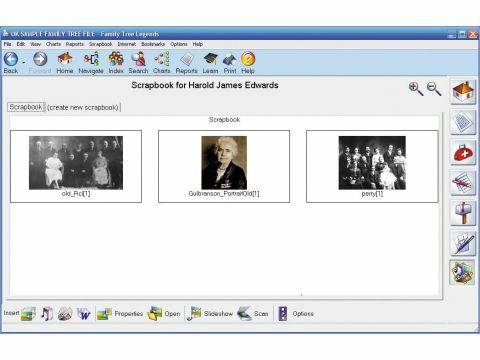 The second set of buttons enables you to create new pages where you store information about that person's descendants and ancestors. So, if you click the 'Parents' button on your own page you'll be taken to another page where you can enter information about your parents. Click 'Parents' again and you can enter information about their parents (your grandparents). All you have to do is enter the information and leave Family Tree to link one generation to another. There's a search facility built into the program, and a number of options for viewing flow-chart illustrations of your family tree, so it's easy to quickly locate an individual and then access information on either their children or descendants. The program is pretty easy to use, although we'd have liked to have seen a printed manual rather than 100 pages of PDF files. But, for just £10 Family Tree Legends is an excellent introduction to the study of genealogy.